Did you see this research paper that was just released? We’ve taken care of a lot of women who were at one point experiencing infertility. 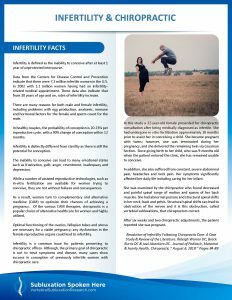 Chiropractic adjustments don’t “treat infertility” in anyway, yet we instead adjust the spine, removing nerve interference and allowing the body to adapt and function better. As a result, often times women become pregnant when their body is working better. If nerve interference is affecting a woman’s ability to conceive, then chiropractic care may be able to help. Have you ever “slept funny”? Video: What’s the best way to wear your backpack?